The Mangahao hydro power scheme was the first of any size in New Zealand. Two dams were built on the Mangahao river on the east side of the Tararuas, one on the Tokomaru river on the west side, and incredibly, these were linked by tunnels which were used to turbo-charge the Tokomaru with water from the Mangahao. They weren't mucking about when they built this. 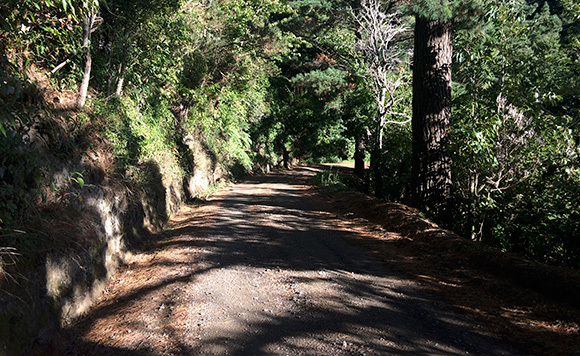 As a result, there are now three reservoirs 400m up in the hills, with an excellent gravel access road which gives a great climb in the wild Tararuas. The dams are easily accessible on a short day ride from Shannon. The mapped route starts from the information centre in the town; follow Mangahao road for 4.5km southeast. The dark-coloured brutal scar running down the hillside facing you is the pipe complex coming down from the lower dam; the light-coloured scar on the hillside is a construction road, happily not the one you have to ride up. If you cannot see these while approaching the valley, the weather is probably not good enough for this ride. Ride up past the power station; the seal on the road ends shortly after that. 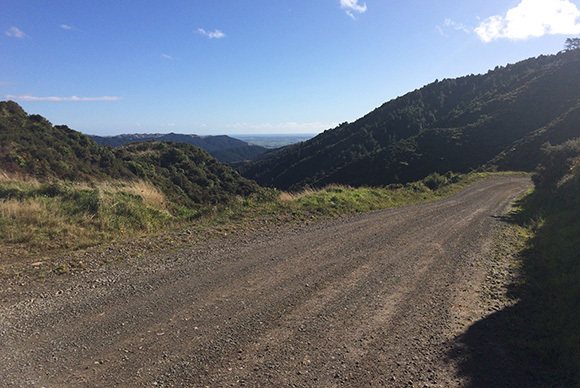 You now have a 6km climb on a well-graded gravel road (the old Tokomaru valley road) to reach the first summit, with great views behind you, after which the road swings southwest and descends to No3 dam. This used to be the Tokomaru river, the remains of which can be seen by standing on the dam and looking over the edge. Because these dams were built in the 1920s, less safety precautions were built in; a single iron rail prevents you falling over the edge, and recently some chicken wire has been added. The surface of the dam is crumbling and mossy; be careful. Continue past the No3 dam, to the far end of the reservoir and the start of the climb up to the highest point of the road at about 500m, after which there is a steep but fairly short descent to the No2 dam. The No2 reservoir is long and thin, basically a wider section of river. The road then winds along the river to the bizarrely-shaped final reservoir No1, which has backed up the Mangahao to the point where a tributary joined the original river. No1 dam is the end of the road, so if you are on a bike you pretty much have to return to Shannon by the same route. It is theoretically possible to force the Mangahao river or other foot trails to get out to the southeast (tramping tracks cross the range), but you'd end up carrying the bike most of the way and it would be very hard. 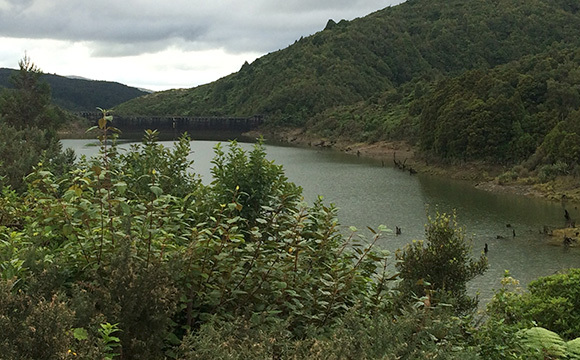 Encouragingly, a groupd of district councils led by Horowhenua have proposed a track from this point at No1 dam over the range to Ekatahuna in the northern Wairarapa, including a hut that would allow overnight stops. They apparently have everything but the money. If you have 3 million bucks to spare... google Missing Link.